It’s like clockwork: any time there’s a tragedy or mass act of violence, you can count on someone using the event to push his or her political agenda. Nine people were murdered at Emanuel African Methodist Episcopal church in downtown Charleston, South Carolina, yesterday. 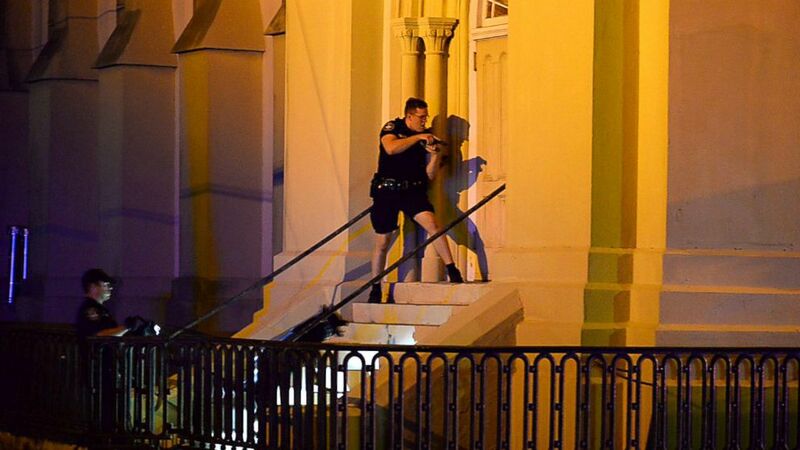 It appears that most, if not all, of the victims in Charleston were black, while the shooter, who was apprehended by police earlier today in North Carolina, is white. While law enforcement officials are yet to comment on the shooter’s motive, it seems certain the shooting was racially motivated. Many have referred to the shooting as a tragedy, but that word is not adequate to capture the evil that was perpetrated on nine innocent men and women who wished only to worship in peace. It was a massacre, a slaughter, a blatant act of terrorism by an individual who deserves not to have his name and visage plastered all over the news, but to rot in obscurity. I do not know how much longer we can thwart the views of the American public on taking reasonable gun safety measures. With all due respect to the addled senior senator from Nevada, his “exercise bands” have victimized more people than my guns have. To politicians like Harry Reid, it doesn’t matter how many people are dead, so long as a crisis presents an opportunity to keep his political agenda alive. However, let’s set aside for the moment the crass and calculated behavior of the classless Democratic congressional leader and examine whether his point was valid. Was the Charleston shooting really caused by a lack of gun control in South Carolina? In a word? No. Not at all. Not even close. In fact, South Carolina has some of the strictest gun control laws in the Southeastern U.S. Open carry, for example, is banned outright. South Carolina is one of only five states in the entire country that bans the open carry of legally owned firearms. The only other states that currently ban open carry outright are California, Illinois, New York, and Florida. In order to legally carry any weapon in South Carolina, you are required by law to obtain a concealed carry permit. And what are individuals required to undergo in order to obtain that permit that allows them to legally carry a weapon? State law requires all concealed carry permit applicants to undergo a criminal background check. They must submit two sets of fingerprints to state law enforcement agencies. After taking a state-approved course on gun laws and safe gun usage, applicants must then pass both a written and live fire test. A ban on open carry? No possession without a concealed carry permit? Mandatory coursework? Mandatory background checks? Fingerprints on file with law enforcement? Gun-free zones? South Carolina’s gun law regime sounds remarkably similar to the agenda gun controllers have been demanding for years. But those requirements aren’t the main reason why Harry Reid’s ignorant politicization of the Charleston shooting is so absurd. The main reason is that South Carolina explicitly bans concealed carry in churches and houses of worship. On top of all the things the state requires individuals to do in order to legally carry firearms, South Carolina law also declares churches to be official gun-free zones. Does this mean the massacre could have been prevented if South Carolina recognized the God-given right of individuals to defend themselves regardless of their location? I have no idea, and neither does anybody else. But what we do know is that nine innocent men and women were slaughtered in a mandatory gun-free zone by an evil madman wielding a gun. More gun laws won’t prevent evil people from doing evil things. Human nature cannot be legislated away. No amount of laws can ever eliminate evil acts committed by evil men. But gun control laws like those in South Carolina certainly can eliminate the ability of law-abiding citizens to defend themselves from those who intend to do evil. And that’s a tragedy.